DAR ES SALAAM, Aug 15 2013 (IPS) - The Chinese characters boldly painted on a supermarket poster in Tanzania’s commercial capital Dar es Salaam say a lot about the growing influence of China on this east African nation. At Kariakoo business district, located a stone’s throw from the city centre, virtually everybody has a story to tell about how the area is rapidly transforming into “Chinatown” due to the huge presence of Chinese merchants engaging in petty trade here. “The world is rough and tough. It’s not a secret that most of us cannot compete with foreign traders who appear to be cleverer. The government should protect us,” Zuwena Simba, a trader at Kariakoo, tells IPS. City authorities estimate that there are more than 100,000 foreign nationals currently working illegally in Dar es Salaam. While the Ministry of Industries and Trade has no exact figures, it is believed that each year thousands of Chinese entrepreneurs come here to work as hawkers or petty traders. The Chinese merchants – who sell a range of commodities, including kitchen utensils, clothing, curtains, electronic gadgets, mobile phones, umbrellas and traditional medicine – appear to be doing brisk trade. But according to the Ministry of Industries and Trade, most Chinese running small businesses are doing so illegally, as many are operating without the minimum capital investment of 100,000 dollars. In Tanzania, foreigners are only allowed to open businesses if they invest this minimum amount. According to the Investment Act of 1997, a prospective investor must deposit a minimum bond of 100,000 dollars with the Tanzania Investment Centre – a government agency mandated to give investors derivative rights. TIC’s director of Investment Promotions, John Mnali, tells IPS that if it is proven that investors are not sticking to the activities listed on their business licenses, then the law should take its own course. “The law is crystal clear. We could, at our own discretion, revoke the license of anyone who is trying to flout investment procedure – before legal action takes place,” he explains. Authorities also say that the Chinese traders are also flooding the market with counterfeit products. The Confederation of Tanzania Industries estimates that Tanzania loses up to 20 percent of total domestic revenue because of counterfeiting. But Zheng Chong, who sells curtains at Kariakoo, dismisses the widespread notion that Chinese traders are flooding the local market with counterfeit goods, and putting locals out of business. He says that the market is driven by the principles of demand and supply. “We have not broken any laws, so there is absolutely no reason for anybody to hate us, we are simply doing business,” he tells IPS. 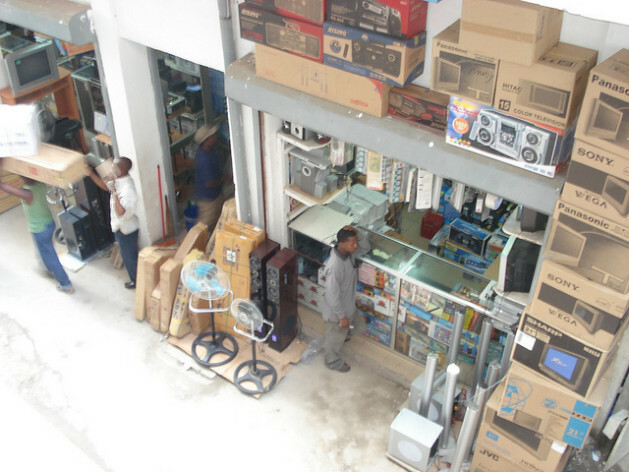 However, a walk through the market reveals counterfeit radio sets, mobile phones, home appliances and even medicines. “Although we are trying our very best to curb [the sale of] these products, we don’t always succeed due to a lack of public awareness, inadequate resources and poor coordination between authorities,” he says. But analysts say that although Tanzania has several laws and policies aimed at curbing the sale of fake goods, they are not enough to entirely eliminate the problem. Legal consultant Goodluck Chuwa, who specialises in business law, says the country needs to have a comprehensive law that addresses the issue. He adds that the government needs to appoint a single regulatory body to monitor the importation of these products. “Everybody is affected in one way or another by these products. Unless we have a specific law that addresses them, we cannot stop the products from entering the local market,” he tells IPS. He says that since the existing laws do not clearly define what counterfeit products are, importers of fake goods have taken advantage of this legal loophole. Two years ago, the Ministry of Industries and Trade issued a 30-day ultimatum for Chinese hawkers to leave the streets of Dar es Salaam, after accusing them of flooding the market with counterfeits. But nothing came of the threat. Observers say that the lack of mechanisms to cushion small and medium enterprises from impending foreign competition is likely to push local traders out of the market. Ngowi says that the Chinese government is encouraging its citizens to invest abroad due to a huge population and dwindling resources. “Most of these traders have certain goals to achieve, they would do anything to make money and send it back home to support their families and indirectly contribute to the [Chinese] economy,” says Ngowi. He says that the sale of counterfeit goods has a direct effect, not only on intellectual property rights, but also on the economy and social structures.